MUFF WIGGLER :: View topic - platinum RTD as thermistor in VCO? platinum RTD as thermistor in VCO? has anyone used these? any comments? they come in limited values (100ohm, 500ohm, or 1k) and have the wrong temperature coefficient (3850ppm/K), but both of those things can be compensated for by adjusting other values in the circuit. the temperature coefficient can be "mixed" with a low drift resistor to alter the effective temperature coefficient. platinum RTDs are much more linear with temperature than common thermistors, and an accuracy of 0.3% is better than finding an absolutely perfect 3300ppm/K thermistor (since 3355ppm/K is the actual coefficient needed). it gives a worst case scenario of 1% error at a CV of 5V and a temperature drift of +50C. thanks for the link. those seem to be +/-10% accuracy, same as the panasonic PTCs. so i finally got around to trying the platinum sensors out. better late than never i suppose. they work pretty well. 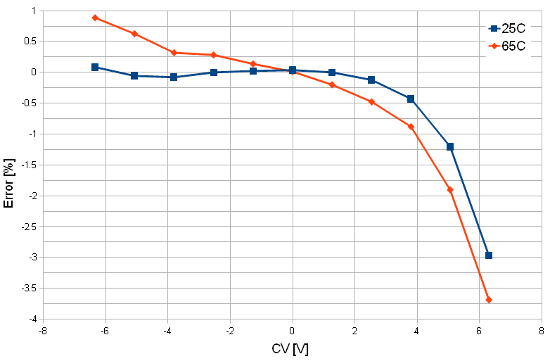 here is a graph of a vishay, 100ohm, 0603, platinum RTD with a PMP4201 matched pair. the error is larger than i expected (about double, i was expecting 0.3% error at 5V CV, and instead its 0.6%). there is a fair bit of emitter resistance error at the higher currents (above 30uA - 2.5V CV here), but there is still a good linear range (+/-0.1%) for 8 to 9 octaves without HF tracking. the circuit used a 4.5ohm resistor in series to water down the 3850ppm/C tempco. you can play with the value of this resistor a bit to get better performance at higher temperatures at the cost of worse performance at lower temperatures. the error is also better for the RTD used as the gain setting resistor in an opamp versus used as a voltage divider at the base of the transistor. i think the 4.5ohm resistor i had didnt have the best tempco, and caused some of the extra error im seeing. i also wrapped the tempco + transistors in an insulator, to help keep them at the same temperature. i tried using thermal paste, but i think it was slightly conductive or something, as i was having leakage current errors (or seebeck effect?) at higher temperature with it, so i got rid of it. im still not fully sure of what was going on. the tests i got working with the thermal paste were slighty better than these. for reference, here is the theoretical thermal drift, with min/max erros due to variations in RTD tolerance. this is for 5V CV. the blue line is a voltage divider, and the red line is an opamp. the dashed lines are the min/max error bounds. in the best case scenario, a 3300ppm resistor has 0.8% error at 65C. given that the cheap ones are +/-10% accuracy, worst case is 4% error. the platinum RTD should bound at an order of magnitude better, and from my one sample test above, it looks like it just about does that. from a test i did on the ERAV thermistors, i got around 2% error at 3V CV. they cost a bit more (2.50$@1 versus 1$@1, 1.3$@100 versus 0.36$@100) but are probably worth it. Thank you for doing this test and for posting the results! One other thing. For matched transistor pairs you might try the MMDT4401 npn pair and the MMDT4403 pnp pair. These transistors have larger base-emitter area and, as a consequence, lower rbe. The late Marshall Leach posted material about low noise audio design on his web site. Still available. The 2N4401 and 2N4403 were recommended to him by an editor at an audio magazine he did a preamp design article for. Reference the National Semiconductor Discrete Databook from 1978, available at the Internet Archive, for die photos and characteristics of different transistor processes. 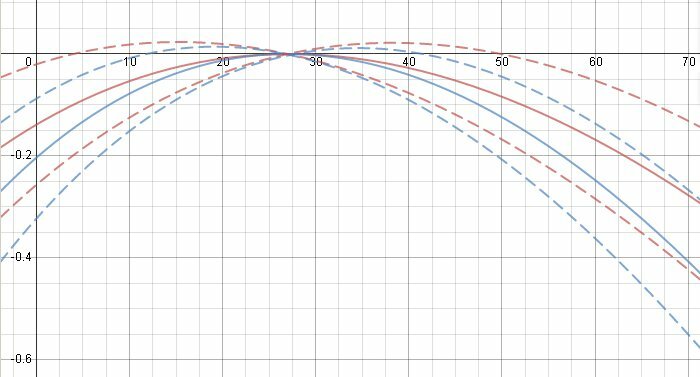 i finished my reasearch into the platinum resistors, and wrote it up as an addendum to my original exponential converter paper. i thought it was a good idea to keep it all in the same place, so anyone looking for the old stuff would stumble across this as well. I've been reading your work up on expo temperature compensation, and I am very interested to try the RTD's out. I am just trying to imagine the best way to thermally couple the 0603 RTD to the SOT363 of the matched transistors. You mentioned in your experiments you had them "close." How close do they have to be to transfer temperature in a meaningful way? There is an exposed copper pour beneath both components, in the hopes of providing a thermal transfer between them. The circle around them represents the area I would glob with hot glue to thermally isolate the components. The components could certainly be closer together, perhaps even pressed against each other, however I was trying to imagine something that could be easily manufactured, and not require hand soldering (hypothetically speaking, of course, I am no synth manufacturer). Does this seem potentially effective? Should I just run with this idea and lay out a board and test it? Has someone already tried this? Whatcha think? that should work well. the trace underneath the parts is probably not as good as just connecting them all to a copper ground plane that is mostly isolated from the rest of the board. the heat will transfer through the ground pin connection on the transistor and the thermistor. a small sticky heat sink bad on the top would be good, but an insulation ring around the whole thing would be best. i would probably take a small piece of foam, and stick it down with a ring of hotglue around the parts, making sure not to get the hotglue between the parts. the sticky conductive pad could go on that piece of foam. I love this thread. I had done some theoretical work on using resistors with tempco >3333ppm, and concluded they should work when "diluted" with a plain resistor in series, parallel, or series+parallel. Happy to see confirmation! This offers a great option. I also like the idea of coupling the sensitive components with PCB traces. Very simple.